Today: This article is not sponsored by Nuts.com, but it may as well be. There's no reason to believe that "Nuts.com" is a legitimate website. If Cats.com and Running.com and Food.com are any indication, Nuts.com will not be at all helpful. And if it is a real website, it’s certainly not a URL you want to type into your browser in the workplace. But against all odds, Nuts.com—a family-owned business founded in 1929 that was called NutsOnline from 1999 to 2012—is a useful website. And beyond that, it's one of my favorite retailers on the internet. This site is magnetic and expansive, a delightful black hole; when you have more than five minutes of free time, go see for yourself. Yes, you'd expect the wide variety of nuts (you can find pili nuts and black walnuts), but Nuts.com stays true to its slogan: "We're more than just nuts." Start by sorting their enormous selection—which ranges from the namesake nuts to coffee and tea to granola to chocolate-covered pretels to make-your-own-trail-mix—by categories that include organic, raw, sugar-free, and gluten-free, and then get more granular than that: For those times when you need three pounds of gold-colored M&Ms or ten pounds of buttered popcorn Jelly Bellys, you can narrow your candy search by color or flavor. You can find raw almonds in the shell, dried mulberries, chocolate-covered bananas, chocolate-covered corn nuts, and a whole selection of chocolate rocks (you know, for when you're crafting a candy terrarium). Order everything you need to make bubble tea (from straws to tapioca pearls to Thai tea powder), pistachio paste for that pistachio babka recipe, and spirulina to add to your green smoothies. Nuts.com makes it easy to find otherwise hard-to-find flours like teff, kamut, and triticale, as well as international snacks like Japanese peanuts and Indian kachori that your local store might not carry, and more dried mushrooms than you'll ever know what to do with. Spend some time browsing and you’ll discover new snacks (or, at the very least, end up scratching your head) when you stumble across dried chokeberries, freeze-dried asparagus, astronaut ice cream, and watermelon seeds. Order a sample size (just $2.50 in many cases), then use the bulk discount when you fall in love. It's the perfect website for ordering ingredients for your favorite granola, stocking up on snacks for a camping trip, or even buying candies for wedding favors. Once you place your order, there’s hardly any waiting at all; with the disclaimer that I live on the East Coast, I will say that every time I’ve ordered from Nuts.com I’ve received my shipment in fewer than three days. I recommend you do what I did in college: Pool a group of Nuts.com fanatics and order your loot to one location to cut down on shipping costs. Then, when your package comes, act like it's Christmas. 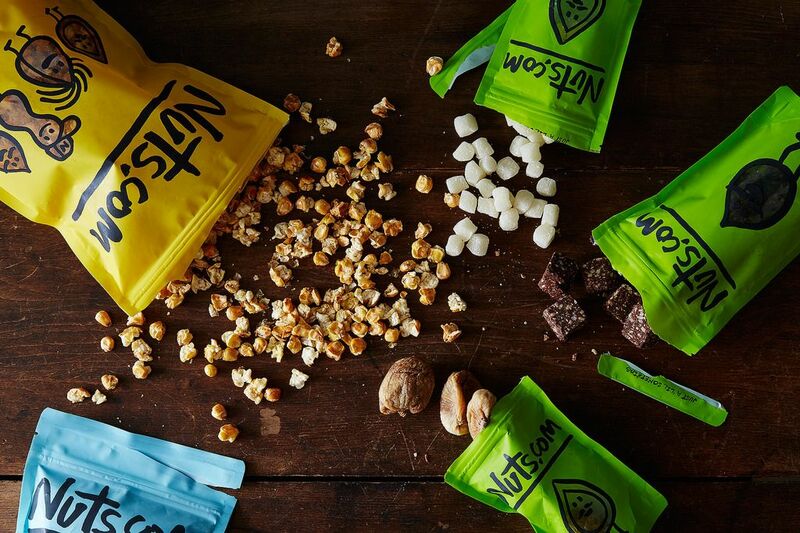 Tear open the box, dive into the colorful bags, and taste one of everything. The silky-textured, brightly colored packaging alone—which was redesigned in 2012 by my biggest company crush, Pentagram—will make you smile, and that's before you've even tasted the sweet and tart dried berry mix or the chewy mochi. 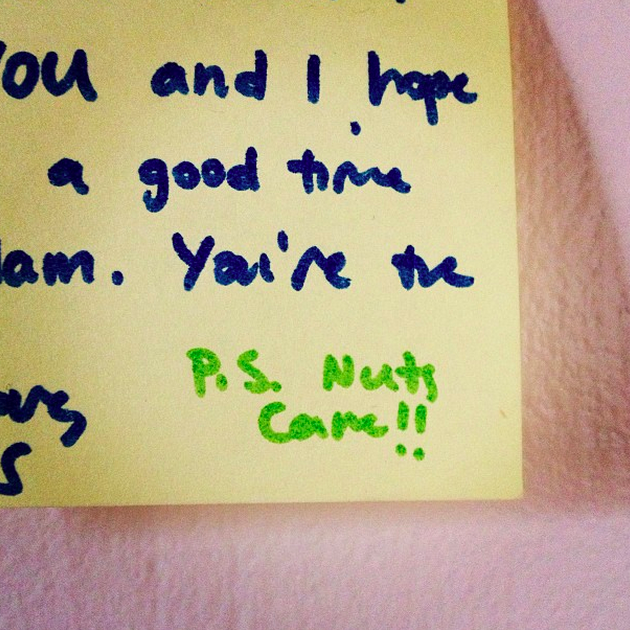 A note from my college roommate included the best postscript ever. I can't remember one item I've ordered from Nuts.com that hasn't impressed me in terms of quality. My staples are dried mango, Medjool dates, Turkish figs, and black sesame mochi, but I like to try one new product every time. With so many items to choose from—and the knowledge that whatever I buy will arrive quickly in adorable packaging—it's a shame not to take advantage of everything the site has to offer. Nuts.com, thank you for all of the snacks and joy have you provided me. This has been my love letter to you. What are your favorite websites to order food from? Tell us in the comments below! Thanks for the 411, I've submitted my first order for hazelnuts (skinned), dates, and organic shredded coconut. Rabbit-hole indeed--much more than nuts! Rancho Gordo for The Best Beans. Not if one is allergic to nuts. My throat began to itch just reading this. I'm now an official fan too! I've been really impressed with the quality of everything I ordered. Probably my favorite thing so far are the marcona almonds. They're better than any I've had (and I've bought them many places because they're a weakness of mine!). Thank you SO much for this! My husband and I are now completely addicted - we've ordered twice since you posted this article. We're going to have many happy friends, we have lots of treats to share! Dried Strawberries are good but if you want the sweet/tart combination go for the Dried Whole Cranberries. They're the bomb! Love the sample size options too so you can try new things without committing to larger packages. My aunt swears by the toasted coconut. LOVE these guys. Placed a big order of snack stiff a few weeks ago and it was 6 days to the Northwest. Pretty darn good. Love the Guacamole Bites and all of the Sesame Sticks... oh, and the cashews... and the freeze dried fruit. I'm doomed! They make the best beef jerky too!!! Sweet & spicy is my absolute favorite - so addicting! I love this website; I'm also on the East Coast but I always get my orders overnight somehow! My favorites so far (still have much to try) include their pumpkin pie fudge, taro root powder, and red velvet sea salt caramels! My friends, family, and I couldn't get enough when I ordered them! Red velvet sea salt caramels - mmmmm! When you place large orders, they always throw in a few free sample packs to get you to try new things. We got these caramels last time and had a fight over who got the last one in the bag! Had to get more! That packaging and its profound adverse environmental impact kills the deal for me. 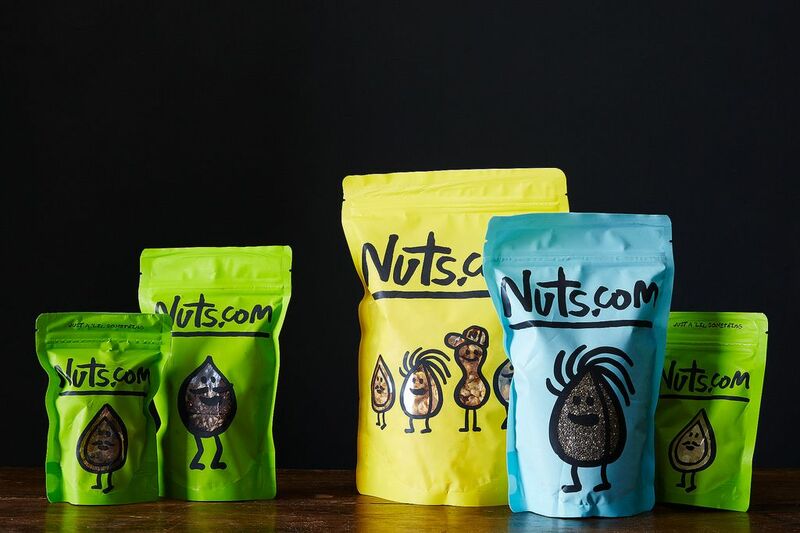 Wouldn't it be great if nuts.com were to offer these products in compostable or recyclable packages? (And wouldn't it be great if Food52 figured environmental impact into its evaluation of products it recommends?) ;o) P.S. Yes, I know I'm a bit of a contrarian, but if someone doesn't speak up for a serious problem that affects every one of us, and our children and their children, which must be dealt with at the individual consumer choice level, who will? Are they something that TerraCycle might take? This site is going to get me into so much trouble. Wait, other people know about how awesome nuts.com is? Makes me love them even more, and trust Food52's judgment even more. A win-win. I've been a fan forever. The dried fruit, especially the strawberries, are awesome and the basis for my double strawberry jam (a crowd favorite.) Around the holidays, I dip the beautiful dried pears in bittersweet chocolate to dress up my cookie boxes. For all of you who have ruined a perfectly good tea towel rubbing the skins off hazelnuts? They have ALREADY SKINNED blanched hazelnuts. Dried nectarines are amazing. I haven't allowed myself to even peek into the candy department because I have no self control. oh... and the coconut! toasted! unsweetened! sweetened! All the coconut. I love Nuts.com! I regularly buy the 5Lb bags of salted, roasted pistachios and raw almonds. My favorite, however, is the dark chocolate turbinado sea salt almonds. I've forbidden myself to buy them since I will scarf down the whole bag in a day or two. I am a huge fan of nuts.com - I buy my baking ground almonds there for my macaron classes and refer my students there are well. It's all I can do to JUST order what I need there - so addictive!! Our stockings are stuffed with nuts.com treats every Christmas. Lemonheads, butterscotch candies, and chocolate covered espresso beans to name a few. We Love Nuts.com! I love the honey roasted nuts and yogurt or chocolate covered pretzels. Dried strawberries also was a surprise hit. Ooh intrigued by the strawberries mentioned by China! Nuts.com is run out of my hometown in Cranford NJ and they stock my favorite licorice chalk (think Good and Plentys but with a minty sort of flavor rather than vanilla). Time to order again! You can save on shipping by picking them up. I live nearby so I place the order over the phone or online and can pick later that day or the next. Love nuts.com! My boss ordered our office a bunch of things from Nuts.com a few weeks ago, and I don't think we've ever been happier! My favorite were the dried strawberries, which Mirabelle now also requests by name. Next time you want to put in an order, I will send Michael into the office with a list! I'll get in on the order! Let's do this. I am so in! Seriously Sarah's enthusiasm has totally won me over.